Maldives is home to perhaps the best beaches in the world. They are on almost every one of the country’s nearly 1200 islands and are so consistently perfect that it’s hard not to become enchanted by them – from white powder sand to luminous cyan-blue water. This fact alone is enough to bring nearly a million tourists every year to this tiny and otherwise little-known Indian Ocean paradise. 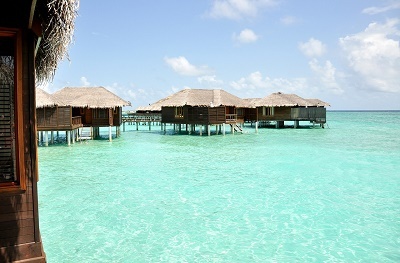 The Maldives are a chain of islands in the Indian Ocean near Sri Lanka and India with around 400 thousand inhabitants. Those considering taking up residence in the Maldives should be advised that Islam is the only religion that is allowed to be practised openly in the Maldives. The Maldivians originally came from northern India and the Maldivian people speak the Dhivehi language, which is in the same Indo-European language family as English. It is written with its alphabet that is based on the Arabic script. The people of the islands were at first devout Hindu, then Buddhist, and finally became Muslim in the year 1153. It was a British protected sultanate from 1887 until it became independent in 1965 and a Republic in 1968. There were three failed coup attempts in the Maldives during the 1980s. The Maldives were devastated by the tsunami in the year 2004 after the large earthquake. There is a real danger of global climate change and rising sea levels that the Maldives could become uninhabitable in this century; for this reason, the Maldives has become the first government in the world to swear off the use of carbon fuels. People of all nationalities are allowed to get a tourist visa for up to 30 days after arrival in the Maldives. According to the website of the Maldivian Department of Immigration and Emigration, Maldivian Immigration may refuse entry to people whom they feel have "strong anti-semantic religious or political views" - which could potentially be broadly defined. There are around 100 thousand foreigners working in the Maldives or illegal immigrants. Most foreigners living in the Maldives are from the other South Asian countries. Nowadays, however, there are also many tourists - around 500 thousand a year - and since 1972, tourism has become one of the pillars of today's Maldivian economy. 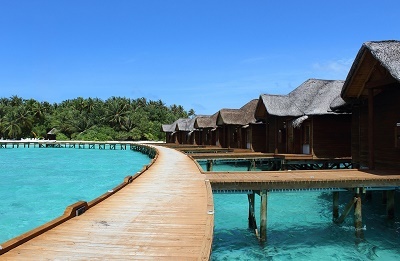 The Maldives has dedicated several entire small islands to resort hotels so that tourists are not likely to encounter native Maldivians at home unless maybe at the capital city, Male. There are many different types of Maldivian music, such as Boduberu and Thaara, and traditional dances to go along with them. Moving to the Maldives is not impossible, but getting a residence permit must be done from outside the country, and it entails getting a work permit first, which means having a job offer from an employer located in the Maldives for a position that no local Maldivian is available to fill. Some expats conduct an ocular visit or initial tour in Maldives before relocating to get a feel for the neighbourhoods and to check rentals. But if you don’t have the budget to do so, you can always go through online portals for real estate properties or contact a local realtor to help you find the best options in the housing market. When moving abroad, always expect that the rental cost does not include the payment for your essential services like water, electricity, gas and garbage collection. In Maldives’s main cities, the average cost of your utilities is €120 per month. Your internet connection will be around €80 monthly, and a minute of local prepaid mobile call is €0.10. With the growing local and foreign population in Maldives, you can expect that there is a shortage of housing, especially in the centre cities. Apartment or house sharing is now becoming a common practice for many residents. You can always choose between a short term and long term rental agreement, depending on the length of time you intend to stay. In Male, the capital of the country, you can get a one bedroom apartment for €600 and a three bedroom unit for €1,300. The rental cost in districts outside the metropolitan are a bit cheaper; €500 for one bedroom and €1200 for a three bedroom apartment. There are two types of educational system being is used across the islands: traditional Islamic that uses Dhivehi as a medium and the modern English-language based curriculum. As an expat, you can enrol your child in an international school like the Ghiyassudin International School Another prominent institution in the country is the Maldives National University, a local school founded in 1973. For many expats, it is easier and more convenient to get help when it comes to importing their belongings to a different country. You will find many shipping and removal companies that will assist you through out the moving process. The average time of delivery to Maldives is 10-19 business days, depending on your country of origin. Containers will arrive in the Port of Male where the local customs officers will conduct an inspection. After giving clearance, the cargos will then be delivered to your new home. For more information about the import regulations in Maldives, click here. Dogs are strictly not allowed for import to Maldives. Other domestic animals should have the International Health Certificate issued by a licensed veterinarian from its country of origin. Also, make sure that your pet is free from any contagious diseases. There’s nothing more rewarding after all these preparations than to know that you’re about to live in one of the breathtaking coral islands of Maldives. The Maldives is an archipelago that boasts an abundance of white, sandy beaches with alluring cyan-blue waters. Its ideal location in the Indian Ocean makes it a home not just to various incredible diving and snorkelling sites but also to expats who want to improve their careers while enjoying life in a paradise-like country. The Republic of Maldives is considered as the smallest country in Southern Asia which covers a total land area of only 298 square kilometres. It is comprised of 1,192 coral islands whereas 200 are inhabited and around 80 functions as tourist resorts. Unlike most popular destinations where the population is high, Maldives only has an estimated population of 373, 471 in 2016. Nearly a third of this island’s total number of inhabitants is comprised of expatriates, and a vast majority are from the Philippines, Bangladesh, Sri Lanka and India. Life in this archipelago is a bit laid back compared to Western or European standard but its simplicity can not be mistaken for dull or boredom. Maldives Islands let you chase your dreams while enjoying exciting water activities amidst the undeniable beauty of the wild, tropical nature. Since Maldives is renowned across the world for its pristine beaches, it is already evident that most fun activities here are related to water. This archipelago is one of the top 5 whale watching destinations in the world and whether you are a single expat or with kids, the Whale Submarine Adventure will undoubtedly capture your attention. The tourist-magnet Whale Submarine is a large underwater vessel that allows people to have a close look at the island’s rare aquatic animals and coral reef life. Aside from sightseeing, scuba diving is also one of the most popular activities in Maldives. The best time of the year to dive is between the January and April when the sun is shining, the sea is at calmest, and the visibility of the water can reach 30m. In the recent years, Maldives also allowed people to roam in other islands without needing to stay in a particular resort. Now, expats can explore other beaches and surfing destinations in Maldives without worrying about being among a multitude of tourists. 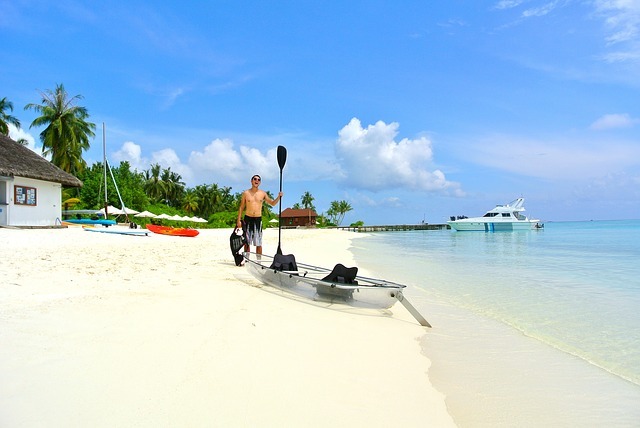 Water sports in this archipelago include kayaking, parasailing, kite surfing and jet skiing. Expat parents in Maldives can also enlist their children to kids' clubs where they will enjoy activities such as puppet theatres, dressing up boxes, organised treasure hunts and biking around the island dressed as pirates. The Maldivian cuisine has strong influences from Sri Lanka and India considering that a huge number of the population are nationals from those two countries. There are three main components of an authentic local dish: mas (fish) particularly kandu mas (tuna), coconut and starch. Maldivian foods are characterised as being hot and spicy with only few vegetables. Expats will soon notice that one of the most common meals that they are about to eat in this island has garudhiya (clear fish broth) served with a side dish of onions, lime and chilli. Maldive fish is often flaked or pounded into tiny pieces and used as flavouring. It is also used as filling for short eats, a dough-wrapped pastry often served as a snack. Because of the rich Indian influence, riha (curries) also became popular in Maldives. It is usually accompanied by roshie which is unleavened bread similar to the papadhu and roti of India. Other staples of the local food are Mas Huni (tuna and coconut mix served during breakfast), Fihunu Mas (fish barbeque basted with chilli), bambukeylu hiti (breadfruit curry) and theluli mas (fried fish mixed with garlic and chilli. Maldives is an Islamic country where the holy month of Ramazan is being observed every year. During this religious observance, the people take their dinner a few hours before dusk and fast until sunset with no meals in between. Come breakfast; the Maldivian will gather on the streets and share their home-cooked meals as a way of festivity. However, not all people will have a full breakfast right away. Expats will notice that the more religious locals only take juice then go back to the mosque for prayer. Islam is also the national and only religion in Maldives. No other religious practices are allowed, and all Maldivian belong to the Sunni sect. By the Islamic faith, the people of Maldives firmly believe that one can go to heaven or hell depending on how he adheres to the five tenets of their religion. They consider someone worthy to enter heaven if they were able to faithfully repeat the creed: ‘There is no God but Allah, and Muhammad is the prophet of Allah’. Islam also dictates the way of life in this island. For example, purchase and consumption of alcoholic beverages are strictly prohibited to Muslims. Expats in Maldives should also know that swimwear or clothes that show too much skin is fine as long as they are inside the beach resorts but when it comes to other parts of the island, it is best to dress conservatively. Though you may not be practicing Islam, it is still best to respect the local traditions and etiquettes that are significantly influenced by the locals’ religion.